Hawg Wings for Super Bowl! What the heck’s a “hawg wing”? Well if pigs could fly, would they have wings? This year, we’re offering up our delicious version of this recent invention from the food industry – that is a reshuffling of the shank portion of the pig. The pork is wrapped around a sturdy bone, in a drumstick fashion which allows you to eat the tender morsels with one hand. They taste like a cross between chicken wings and barbecued ribs. If you’re tired of chicken wings, or just want something meaty and different, come on in and check out our hawg wings! Surprisingly, I asked Richard a few weeks ago if he had stocked up on chicken wings for the Super Bowl party weekend and he replied “no”! What? Sacrilege! 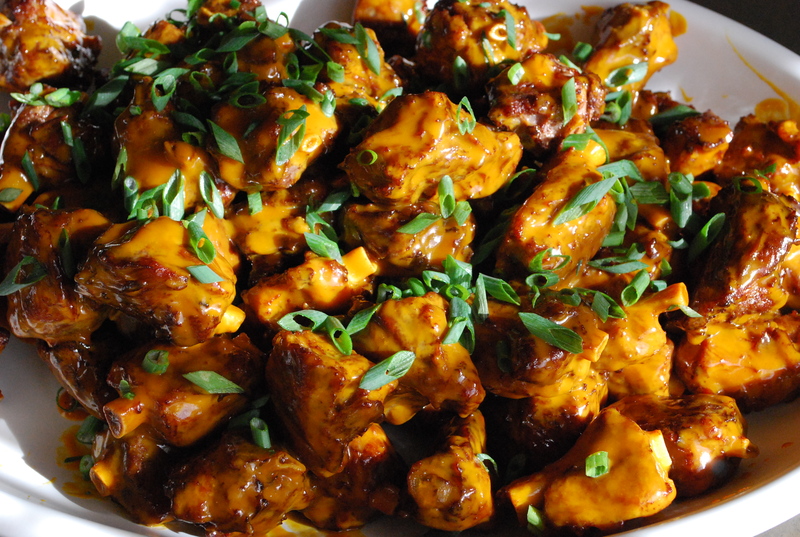 How could you NOT have chicken wings for the Super Bowl? Then he explained that the price of wings had skyrocketed out of sight and most of the big chains had bought up all the wings. He couldn’t even get ahold of wings, almost two weeks out from the Super Bowl. This reminded me of the old days when we owned a restaurant and the liquor companies would jack up the cost of champagne a month or so ahead of the holidays. Unfair!! or just the American way? Anyway, enter the hawg wing! And I have to admit – I tried my first one today and they ARE delicious! So if you want a special treat to take to your party tomorrow, stop on in and get a bunch! If you’ve never had the pleasure of eating as many chicken wings as you could possibly imagine, then you should definitely put a big star on your calendar for this upcoming weekend and get your fanny down to Cantine Field in Saugerties, New York for this great event! 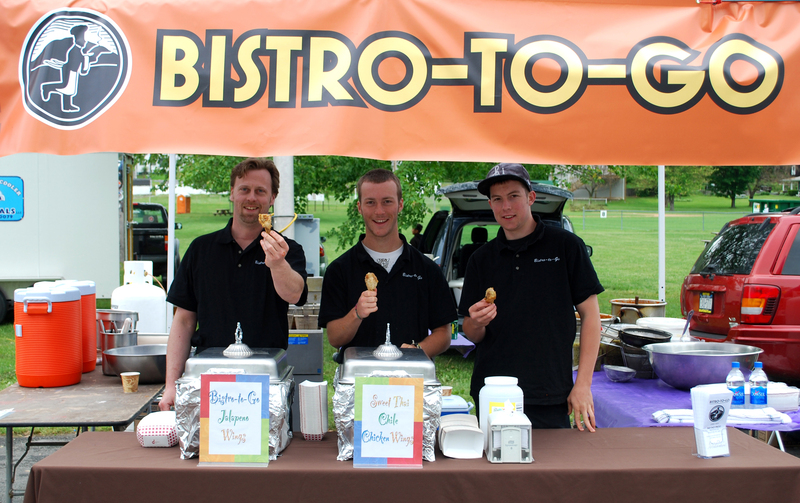 Last year was our first, but definitely not our last as we came away with the People’s Choice Award for the Best Chicken Wings in Ulster County. YAHOO! and YEEHAH! So how do you even begin to plan for something like this when you’ve never done it before? We had heard wild stories from the year before that the vendors were crazy running out of wings early on in the day, so we racked our brains and came up with the figure of 5,000 wings, hoping this would take us through to the end. And it almost did – we ran out of wings around 4:30 – much better than some of our counterparts that were looking to buy some of our product mid-day. Jonathan Sheridan has been known in many of his former “chef-ing” jobs (Vong / NYC and Rosendale Cement Company to name a few) as an am azing creator of wing recipes, so we let him have free reign to come up with last year’s prize winners: Sweet Thai Chile Wings and Spicy Jalapeno Wings. 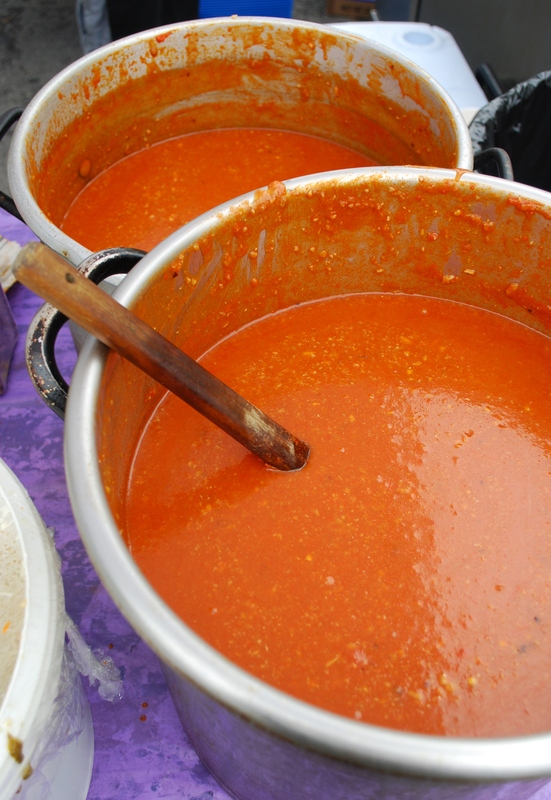 This year’s recipes will remain a secret until aft er the competition, but you’ll be able to come in to our store, sample them and guess the recipe AFTER the Wing Fling. But honestly, we’d rather have you come on down and give us your vote! Thought you’d enjoy a few snapshots from last year’s competition. 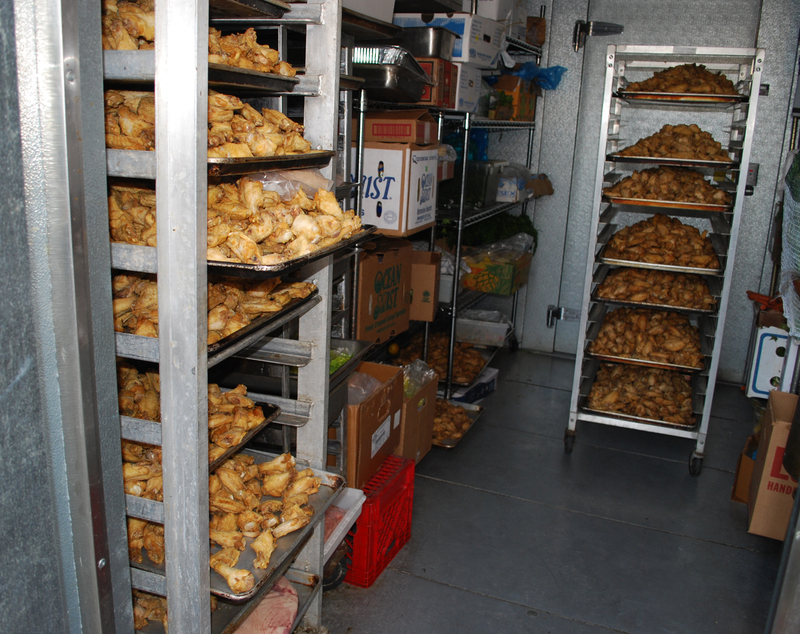 Try to imagine what 5,000 chicken wings would look like in our walk in? Or prepping 5,000 wings to be cooked and then transported to the event where we finished them off in the fryer and tossed them in the finger-licking sauce. So this week, that’s what we’ll be up to!!! Sounds like fun doesn’t it?